Two Rooms...One Fire! As either a see through or corner unit, the two sided P121 is sure to impress. Share the heat and view of this Regency fire in two rooms at once or transform a simple corner into a dramatic focal point. Customize both sides with stylish Panorama accessories. 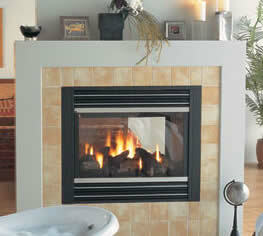 With beauty and versatility, this fireplace will brighten any room in your home.